This article is about Domino’s Pizza (DPZ) and why it’s a great buy for the total return investor that also wants some dividend income. Domino’s Pizza is one of the largest fast food companies in the United States and foreign countries. Domino’s Pizza will be evaluated using The Good Business Portfolio guidelines, my IRA portfolio of good business companies that are balanced among all styles of investing. The company has steady growth and has cash it uses to increase the dividends each year and open new stores. When I scanned the five-year chart, Domino’s Pizza has a good chart going up and to the right on a strong upslope from 2015 through to date. This is the kind of chart I like showing the defensive nature of their business with straight line growth. Fundamentals of Domino’s Pizza will be reviewed on the following topics below. I use a set of guidelines that I codified over the last few years to review the companies in The Good Business Portfolio (my portfolio) and other companies that I am reviewing. For a complete set of the guidelines, please see my article ” The Good Business Portfolio: Update to Guidelines, August 2018″. These guidelines provide me with a balanced portfolio of income, defensive, total return and growing companies that hopefully keeps me ahead of the Dow average. Domino’s Pizza International passes 10 of 11 Good Business Portfolio Guidelines, a good score (a good score is 10 or 11). These guidelines are only used to filter companies to be considered in the portfolio. Some of the points brought out by the guidelines are shown below. The Good Business Portfolio Guidelines are just a screen to start with and not absolute rules. When I look at a company, the total return is a key parameter to see if it fits the objective of the Good Business Portfolio. Domino’s Pizza passes this total return guideline against the Dow baseline in my 51-month test. I chose the 51 month test period (starting January 1, 2015, and ending to date) because it includes the great year of 2017, and other years that had fair and bad performance. 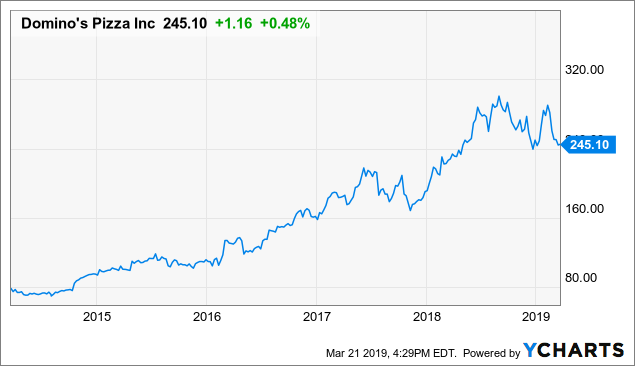 The good total return of 153.85% makes Domino’s Pizza a great investment for the total return investor that also wants a steadily increasing income. DPZ has a below average dividend yield of 1.1% and has had increases for seven years making DPZ also a fair choice for the dividend investor. The Dividend was increased February 2019 to $0.65/Qtr. from $0.55/Qtr. or an 18% increase. For the last quarter on February 21, 2019, Domino’s Pizza reported earnings that missed expected by $0.07 at $2.62 and compared to last year at $2.09. Total revenue was higher at $1.09 Billion up more than a year ago by 21.38% year over year and missed expected revenue by $7.9 Million. This was a mixed report with the bottom line increasing over last year but missing expected earnings and the top line increasing. The next earnings report will be out late May 2019 and is expected to be $2.14 compared to last year at $2.00. Domino’s Pizza is one of the largest fast food companies in the United States and foreign countries. Domino’s Pizza is a pizza restaurant chain company. As of January 1, 2017, the Company operated in over 13,800 locations in over 85 markets around the world. The Company operates through three segments: domestic stores, an international franchise, and supply chain. Its basic menu features pizza products in various sizes and crust types. Its stores also offer oven-baked sandwiches, pasta, boneless chicken and wings, bread side items, desserts, and soft drink products. 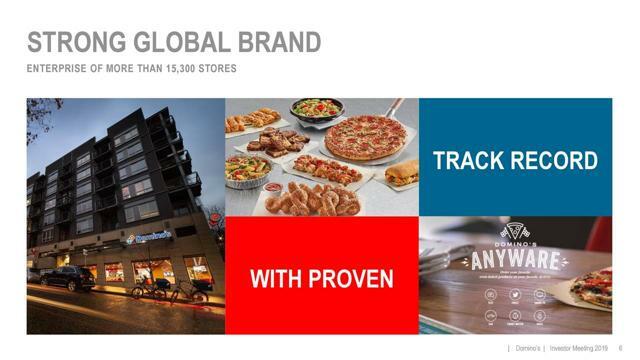 Overall Domino’s Pizza is a good business with 17% CAGR projected growth as the United States and foreign economies grow going forward, with the increasing demand for DPZ’s fast food. The below average dividend income brings you cash as we continue to see further growth as the world economy grows. The FED has kept interest rates low for some years, and on December 19, 2018, they raised the base rate of 0.25%, which was expected. I believe that they will go slow in 2019, which should help keep the economy on a growth path. If infrastructure spending can be increased, this will even increase the United States growth going forward with better economics for the consumer. At the March 20 meeting, the FED lowered United States GDP projection for 2019 which may mean they are getting to neutral on the economy, projecting no rate increases for 2019. The FED meeting Statement was a wait and see and a bit more dovish than the last meeting. I’m pleased with what was a terrific fourth quarter, one that capped another outstanding year for Domino’s. Our results continue to outpace the industry and our franchisees across the globe continue to make me extremely proud. Retail sales growth matters, and once again we delivered. Our global retail sales growth reflected a strong balance, across our US and international businesses. For both businesses in Q4, our growth reflected a healthy blend of unit growth and traffic driven same-store sales. Looking first at our US business, double-digit retail sales growth in Q4 was comprised of a very healthy and order count driven 5.6% comp and 125 net new units. Turning now to International, we delivered strong retail sales growth for the fourth quarter and a double-digit result for the whole year. Fourth quarter net unit openings were particularly strong and represented a significant acceleration over previous quarters. 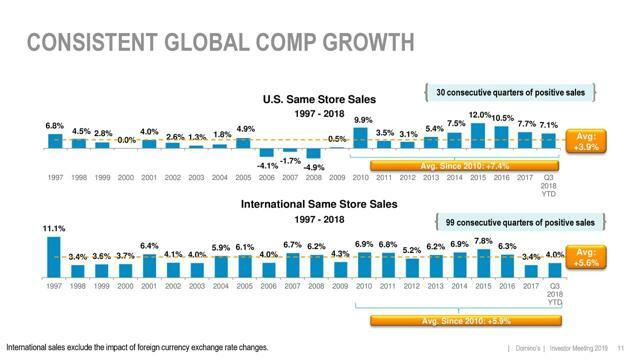 Same-store sales performance can certainly improve versus what we have all come to expect, but I’m pleased to see all of our comp coming from order growth. This shows the feelings of top management for the continued growth of the Domino’s Pizza business and shareholder return with an increase in future growth. DPZ has good growth and will continue as the foreign economies grow and demand for fast food increases. Domino opened 1058 new stores in 2018 with expectations of more to come in 2019. The graphic below shows the global growth of Domino’s Pizza over the years with increasing sales almost every year as stated by the CEO. Domino’s Pizza is a great investment choice for the total return investor with it’s above DOW average total return and the dividend growth investor for income. Domino’s Pizza will be considered for The Good Business Portfolio as an addition to the McDonalds (MCD) position since they sell different products. If you want a growing dividend income and great total return in the fast food business, DPZ may be the right investment for you. On March 13 increased position of Realty Income Corp. (O) to 0.85% of the portfolio, I could use a bit more steady monthly income. On March 12 the portfolio closed out the position of Arconic (ARNC) , I only have one more commodity play Freeport McMoRan (FCX) that I think will go up over time. On March 11 the portfolio reduced the position of Arconic (ARNC) from 0.4% of the portfolio to 0.3%. I will sell the rest of this position within the month. The dividend was just cut, and forward growth is under-par. On March 7 added to position of Simulation Plus (SLP) from 0.33% of the portfolio to 0.45%. I will add slowly to this position as available cash allows. On March 4, trimmed position of Hewlett Packard (HPQ) from 1.3% of the portfolio to 1.0%. The last earnings report was poor, and future growth looks weak at 2%, time to sell HPQ for a better business. On February 28, trimmed position of Boeing (BA) from 16.1% of the portfolio to 15.8%. I love Boeing, but you have to have diversification. On February 2 increased position of Realty Income Corp. to 0.7% of the portfolio, I could use a bit more steady monthly income. On January 30 increased the position of Simulations Plus from 0.2% of the portfolio to 0.4%. I think their product may be the product of the future for drug testing. On January 28 Bought a starter position of Realty Income Corp., I could use a bit more steady income and hope to add to this holding in the future. Realty Income Corp. is now 0.4% of the portfolio. On January 28 sold the remaining portion of Mondelez (MDLZ). The forward growth does not look good enough. On January 24 increased the position of Digital Reality Investors (DLR) from 3.1% of the portfolio to 3.6%. I want to get DLR up to a full position of 4%. On January 16 sold the remaining shares of 3M (MMM). I decided to sell this small position in order to reduce the number of positions with a new target number of 20 positions max from 25. On January 11 started a new position in Lockheed (LMT) at 0.65% of the portfolio. The Good Business Portfolio trims a position when it gets above 8% of the portfolio. 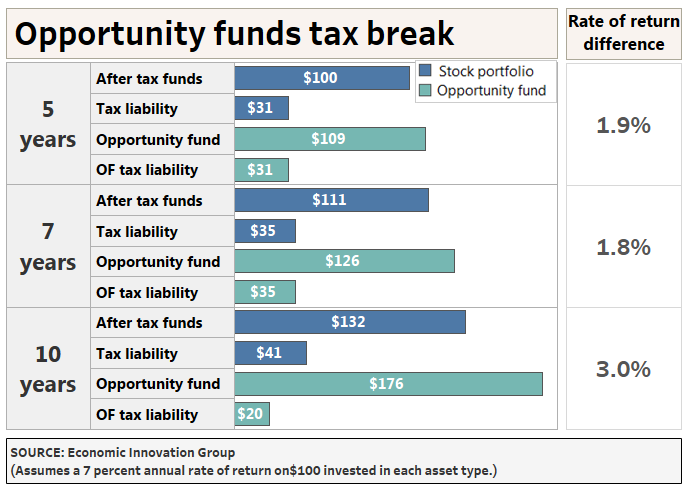 The five top percentage of the portfolio companies in the portfolio are, Johnson & Johnson (JNJ) is 8.3% of the portfolio, Eaton Vance Enhanced Equity Income Fund II is 8.0% of the portfolio, Home Depot (HD) is 8.8% of the portfolio, Omega Health Investors (OHI) and Boeing (BA) is 14.8% of the portfolio. Therefore BA, EOS, JNJ, OHI, and Home Depot are now in trim position, but I am letting them run a bit since they are great companies. Boeing is going to be pressed to 15% of the portfolio because of it being cash positive on 787 deferred plane costs at $316 Million in the first quarter of 2017, an increase from the fourth quarter. The first quarter earnings for 2018 were unbelievable at $3.64 compared too expected at $2.64. Farnborough Air Show sales in dollar value just beat out Air-Bus by about $6 Billion, and both companies had a great number of orders. Boeing received an order for 18 more KC-46A planes. The second quarter 2018 earnings beat expectations by $0.06 at $3.33, but a good report was hurt by a write off expense on the KC-46 which has started delivery in 2019. Two KC-46A tankers were delivered in January 2019. As a result of the good fourth-quarter earnings, S&P CFRA raised the one-year price target to $500 for a possible 20% upside potential. Boeing has dropped in the last 2 weeks because of the second 737 Max-8 crash, and I look at this as an opportunity to buy BA at a reasonable price. This is just my opinion. For the total Good Business Portfolio, please see my article on The Good Business Portfolio: 2018 4 th Quarter Earnings and Performance Review for the complete portfolio list and performance. Become a real-time follower, and you will get each quarter’s performance after the next earnings season is over. Disclosure: I am/we are long BA, JNJ, HD, OHI, MO, IR, DLR, GE, PM, IR, EOS, TXN, ADP, FCX, MCD, O. I wrote this article myself, and it expresses my own opinions. I am not receiving compensation for it (other than from Seeking Alpha). I have no business relationship with any company whose stock is mentioned in this article. Additional disclosure: Of course, this is not a recommendation to buy or sell, and you should always do your own research and talk to your financial advisor before any purchase or sale. This is how I manage my IRA retirement account, and the opinions of the companies are my own. This entry was posted in Bank Stocks on March 30, 2019 by admin.